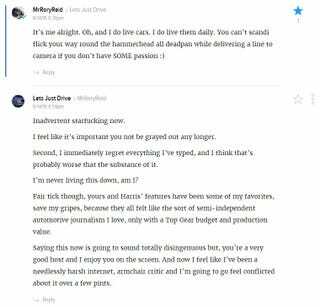 Here’s the conversation in which Rory Reid replies to my rant and leaves me feeling like a deflated windbag, you know - the kind that complains about everything without ever actually doing anything. Mr Reid, if you read this (oh c’mon puns!) just know I’m really very sorry and that this was an important learning moment I won’t soon forget. Also, if you ever get over Canada way, poutine and beer is on me. Did This Imgurian Spot a 1 of 12 Lamborghini DiabloVT Momo Edition?